It’s time to rock the house. I could say “drywall the house,” but “rock the house” sounds way more exciting. Similarly, we refer to the 1/2-inch drywall sheets themselves as “rock,” and the pros we hired to install them are “rockers.” They’re a duo from Poulin Drywall, and they work lightning fast: in just two days they’ve completed 95% of the second-floor walls and ceilings and are moving operations to the first floor. We do all we can to keep ahead of the rockers. 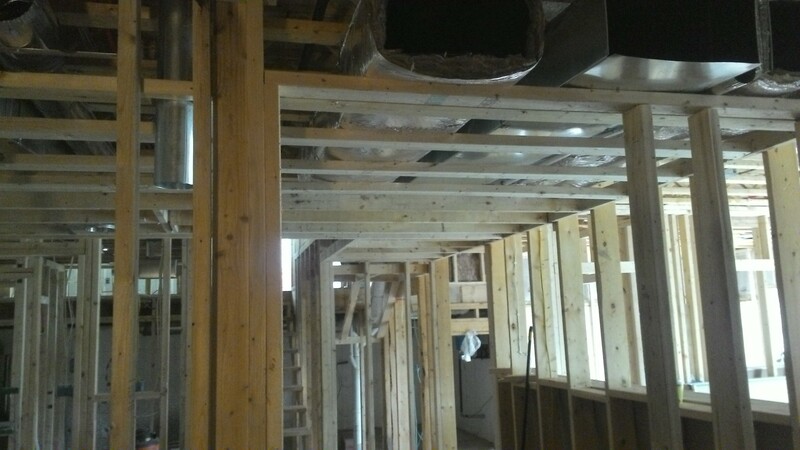 In the basement, we built drop ceilings to hide the many pipes and ducts that hang below the floor joists. Framing a drop ceiling is similar to framing a stud wall: you nail parallel pieces of lumber between two end plates at regularly-spaced intervals. The main difference, of course, is that a drop ceiling can’t support itself. End plates get nailed to studs on the surrounding walls. The cross pieces must span between the end plates. If the distance is too great, and the weight of drywall would cause the cross pieces to sag, then you strengthen them by running another perpendicular plate for support at midspan… or dream up a more creative solution. Drop ceiling over the basement hallway. I thought we finished building walls long ago, but we had to build walls this week as well. The basement hallway and laundry room gained closets. The library received a sliding door frame, assembled with internal hardware so the double doors themselves will fit nicely. And most of the ICF walls got “studs” around the inside perimeter, screwed in place to the plastic webs hidden in the polystyrene. At the expense of a few square inches of floor space, these studs make room for electrical outlets, and having an obvious place to secure screws makes the rockers’ job far easier. 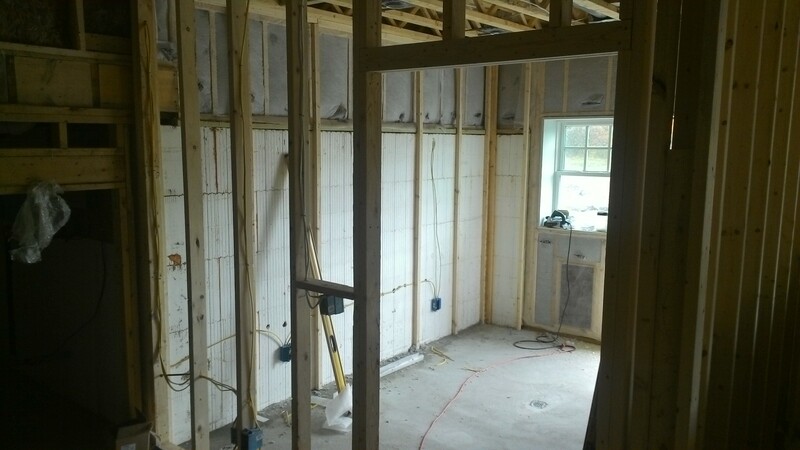 2-inch-deep “studs” in front of the ICF wall. 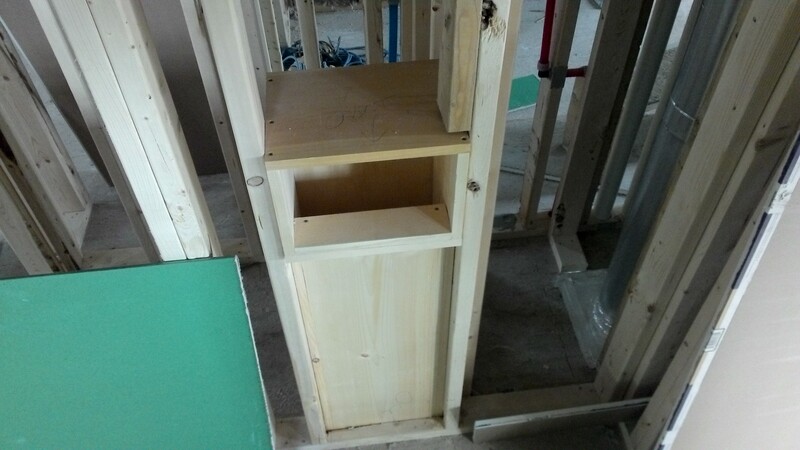 One more necessary detail: we finally built the laundry chute! In a similar vein, Terry examined every room and closet in the house and determined where we needed to install nailers. 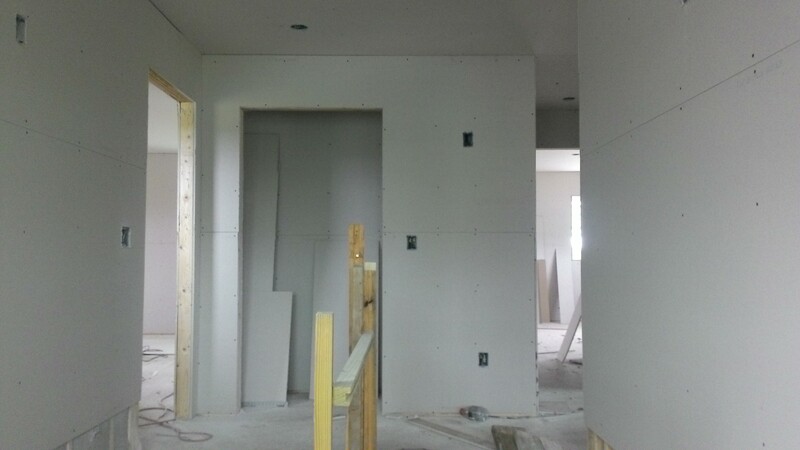 Drywall, like plywood, works best if the entire perimeter is attached to something, particularly the corners. Therefore every edge of every room – the wraparound where two walls meet, the outside fringes of a ceiling – needs a piece of lumber to screw the rock into. I can’t tell you how many times we thought we were done with lumber indoors, only to discover more incomplete tasks and send Terry running for additional 2x4s. At least four times in the last week and a half. One little interior framing detail still remains, well actually two: the walls that flank some cabinetry on the west side of the kitchen. We’ll assemble those tomorrow, then move back outside and turn our house over fully to the rockers. Top of the stairs. Sure looks different now!